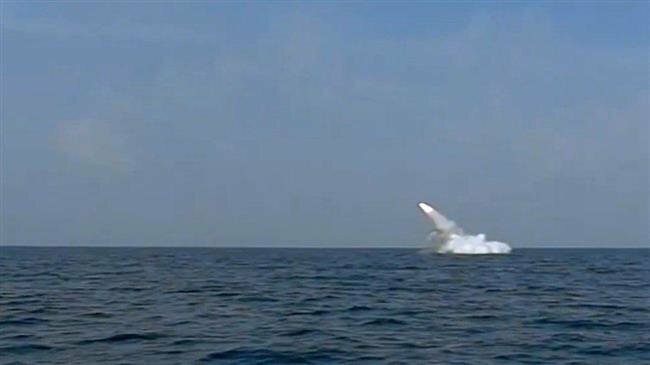 On the third day of major annual drills by the Iranian Navy, a Qadir-class submarine has successfully fired an anti-surface cruise missile. Tasnim news agency reported the launch on Sunday, saying that it was the first time the missile was being fired at a mock target from the depth of the sea. The launch of the cruise missile cannot be detected by enemy forces whereas there is a likelihood for the launcher submarines to be detected when firing torpedoes, which also have a comparatively shorter range, the report said. Other submarines, such as Tareq and Fateh, also have the capability to launch the cruise missile, the report added. The naval exercise, code-named “Velayat 97,” is being held in an area of two million square kilometers, from the Strait of Hormuz to the southeastern coasts of Makran, the Sea of Oman, and the northern parts of the Indian Ocean, down to the 10-degree latitude. In recent years, Iran’s Navy has attained self-sufficiency in producing defense equipment and increased its presence in international waters to protect naval routes and provide security for merchant vessels and tankers. It has foiled several attacks on both Iranian and foreign tankers during its missions in international waters.